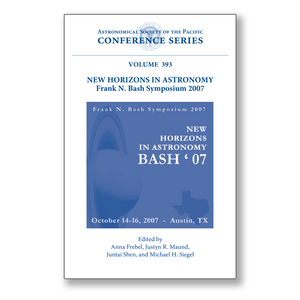 These are the proceedings of the 2007 Frank N. Bash Symposium, held at the University of Texas at Austin, USA, from October 14-16, 2007. The first "BashFest" was held in 2003 in honor of Professor Frank Back at his retirement. Since then, the symposium has evolved into a bi-annual event featuring exclusively the research of young astronomers and astrophysicists from around the world. The symposium centered around invited review talks by thirteen postdoctoral researchers covering the vast range of modern astronomical research, from the dynamics of small bodies in the Solar System, to globular clusters in the Milky Way and neighboring galaxies, to theories and observations of galaxy formation in the early Universe, and the instruments being designed for the thirty-meter class telescopes that will be used to study these diverse fields. Poster contributions from undergraduate and graduate students as well as postdoctoral researchers rounded out the conference. These posters also covered a wide variety of topics, including abundances in metal-rich and metal-poor stars, galaxy formation and evolution, multi-wavelength observations, and theoretical studies of supernovae and the early Universe.